One of the major ideas of Adventure Time is that a bright, playful children’s cartoon world could have a tragic past of death and destruction, and the series gained more and more depth as it devoted extra time to exploring the history of this post-post-apocalyptic Earth. There’s darkness underneath this show’s candy-colored cuteness, and Gunther is the embodiment of this dynamic in “Orgalorg,” which reveals that the penguin is actually an alien death-god that was banished to Ooo after a battle in the stars against Grob Gob Glob Grod. “Orgalorg” is written and storyboarded by Graham Falk, and he eases the reader into the story with wacky penguin antics to make the sudden shift into cosmic territory all the more disorienting. 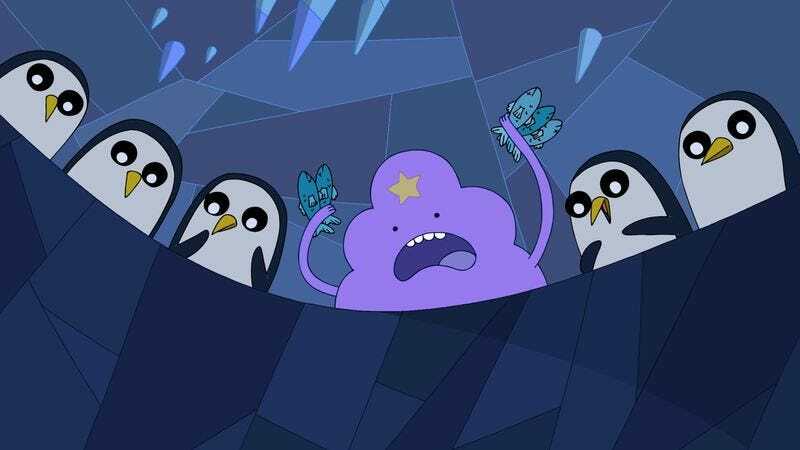 The episode starts with Gunther trying to get Ice King to eat a slice of cheesecake with a sleeping gas grenade topping, and after Gunther forces the artillery down Ice King’s throat, the penguins throw a big house party with guest of honor Lumpy Space Princess. That opening sequence invites the audience in via humor, and that relaxation is heightened by the environment of the party, which has a very chill, carefree energy. Falk spotlights a lot of different moments of the party, and there’s a specificity to these celebratory snapshots that makes it feel like the kinds of impromptu gatherings I attended fairly often in college. Unfortunately for me, my college parties never had walrus races. And unfortunately for Ooo, Gunther’s party does. When he jumps into the racing pit to save LSP, Gunther is thrown against the wall by a charging walrus and cracks open his skull, revealing the glowing green brain inside. The color palette dramatically changes to an eclectic mix of pastels to signify the change in Gunther’s perspective, and the music becomes very foreboding and eerie as he begins to have visions of his past life. He carves some wooden figures and performs a magical spell that sends a message to an alien planet that Orgalorg has returned, but when Gunther realizes the terror his broadcast is causing, he breaks free of the spell and destroys the magical objects. On the alien planet is where we learn about Orgalorg, the breaker of worlds that ruled the universe with his cruel and deadly whims. He angered the King Of Mars when he tried to absorb the essence of a “catalyst comet,” and was cast down by Grob Gob Glob Grod, losing his memory as he crashed to Earth and was transformed by the planet’s gravity into a “more powerless and cuddlesome” form. Was that “catalyst comet” the thing that hit Earth back in “Evergreen” and wiped out the dinosaurs? I believe so, meaning that Orgalorg’s arrival on Earth was heralded by an extinction event, reinforcing his position as world-breaker even as he was cut off from that role. If you recall, Ice King’s crown is the thing that could have stopped the comet from hitting Earth millennia ago, and it’s very possible that Gunther’s possessive feelings of Ice King stem from a subconscious desire to get his hands on the weapon that could stop Orgalorg if he breaks free. The thing protecting everyone was Gunther’s amnesia, but now Orgalorg has been awakened, which means very bad things for Ooo. With three episodes left in the season, the writers are building up a lot of big threats for the finale, and it will be interesting to see how much all of the Magic Man/Lich/Orgalorg drama plays into these final chapters. In a universe that is essentially unbridled creativity put on the screen, it makes sense that there would be forces of chaos that threaten the flow of imagination. These entropic agents can never be truly eliminated, and even if they are defeated in combat, they find ways to come back in forms that are less likely to attract attention. The Lich becomes Sweet Pea. Orgalorg becomes Gunther. The darkness is wrapped up in cuteness, and much of this season has focused on how these appearances can be very deceiving. Which begs an ominous question: What other horrors are hiding under the lovable surface of Adventure Time? There’s some outstanding design work done on the alien planet, from the lush, exotic foliage to the off-kilter, geometric characters. I don’t know how much of that is Falk and how much is the prop and character designers, but I do know it looks gorgeous. 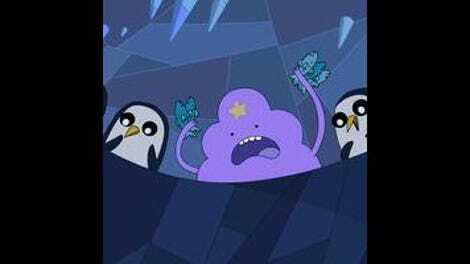 LSP really needs to stay away from animals.